Congratulations to Brendon Desaulniers, winner of the 2017 WHL Jersey Contest sponsored by Rempel Insurance Brokers and the Insurance Brokers Association of Manitoba. 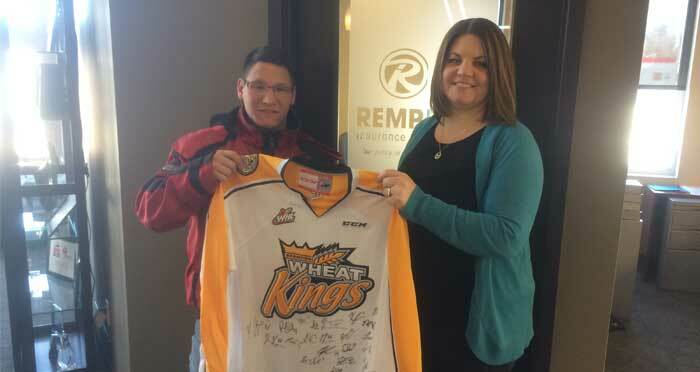 Kellie Collette-Funk presented Brendon with a Brandon Wheat Kings autographed jersey. Brendon’s name has also been entered into the grand prize draw for a trip for two to the MasterCard Memorial Cup in Windsor Ontario.